The branch drafts species action plans for those moths and butterflies of conservation concern that can be found in Suffolk. These plans are used to direct moth and butterfly conservation work in the county. There are no Butterfly Conservation reserves in Suffolk but the branch views the whole of the county as its reserve and acts to promote conservation of butterflies wherever it may be needed. Recent work parties have helped improve the habitat at various sites for the Silver-studded Blue butterfly, one of Suffolk's more localised butterflies. Advice is provided on maintaining suitable habitats for butterflies and moths to landowners and agencies within the county. In 2007, the Suffolk Branch undertook an exciting project to benefit one of Suffolk’s rarest butterflies, the Silver-studded blue. The purpose of the project was to create a new colony of Silver-studded Blues on Blaxhall Common by relocating adult butterflies from sites elsewhere on the Sandlings heaths. Donor sites at Lower Hollesley Common and Minsmere’s Sawmills colony each provided 30 adult butterflies, and these were translocated to Blaxhall Common in June & July of 2007. The butterflies laid eggs and have now survived their first five winters. A transect walk was undertaken by volunteers, and in the summer of 2008, a dozen or so Silver-studded Blues were to be seen enjoying their new habitat. Both sexes remained on the wing for a month or so. The 2009 monitoring proved that wild pairings had occurred and the new colony was present in slightly increased numbers. Numbers increased in 2010, and in 2011 the transect walk achieved a record index of 155, finding up to 45 adults on the wing over a 9 week period from 2 Jun to 28 July. The 2012 season has been another success at Blaxhall - in the face of a generally awful year of disruptive weather. This marks five seasons of progressively rising numbers, flying for a longer flight period each year, which is most encouraging. The area of the common over which they are flying has also expanded slightly. 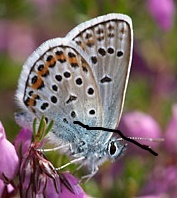 Silver-studded Blues are only found on heathland and have very specialised needs. They prefer low-growing bell heather and their life-cycle depends on the presence of a species of black ant that looks after the butterfly during the early stages of its life. Blaxhall Common does have healthy populations of the ants, Lasius psammophilus, and excellent heathland habitat which (to the human eye) appears ideal. The passage of time suggests that the butterflies are content with their new home. 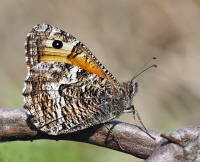 The scheme is a joint project between the Suffolk Branch of Butterfly Conservation and Suffolk Wildlife Trust, who manage the site at Blaxhall. It was made possible thanks to a grant from the Suffolk Coast and Heaths Connect fund, using money raised by Suffolk Secrets, a local tourism business. A keen team of local volunteers are playing a continuing part in the maintenance of the heath and monitoring the new colony. 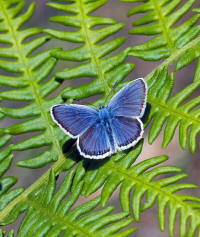 The Silver-studded Blue is one of the UK’s rarest butterflies. It has suffered a significant long-term decline in numbers, although in recent years, this has been stabilised, largely due to improvements in heathland management such as that carried out by members of the Sandlings Group. Suffolk has a small but nationally important population of Silver-studded Blue, a butterfly that features in the UK Biodiversity Action Plan and may only be legally introduced with proper authorisation and appropriate ecological safeguards. An Update on the Population of Silver-studded Blue over the 6 years since its Translocation to Blaxhall Common. The translocation in 2007 of 60 adult Silver-studded Blues to Blaxhall Common in 2 batches from 2 different donor sites was notified to the Joint Committee for the Conservation of British Insects, and followed up with a detailed account of the re-establishment attempt in a special edition of the Suffolk Argus (2008). The consents required us to accept the obligation to maintain the habitat and to monitor the health of the colony over a minimum period of 5 years. What follows is a progress report on what appears to have been a successful establishment. A longer version has been submitted to Invertebrate Link and to Butterfly Conservation’s head office. The code of conservation practice for the translocation of invertebrates (JCCBI, 2010) and the International guidelines for reintroductions and translocations (IUCN, 2013) both stress the need for responsible post-release monitoring, outcome assessment and continuing management of the release site. The importance of disseminating information on establishment attempts is also stressed. 1. A progressively rising single day peak count for each year. 2. The total count for the whole transect season. This also rose progressively, apart from a slight dip in 2012 (a poor season for most species). 3. The number of consecutive transect weeks in which P. argus was recorded. 4. within the 8 sections of the transect, and latterly beyond the boundaries of the transect. The observations were made mostly by the local volunteers, and some by casual recorders on occasional expansion has been to a triangle of pioneer heather to the south west of Section 1. On two occasions, singletons have been seen to the south of the B1069. One additional element became available in 2013, through the co-operation of Dr Neil Ravenscroft, a professional ecologist living in Blaxhall. He conducted an independent assessment of the flight areas, walked 3 mini transects and extrapolated the likely population of the entire site to something in the order of 900. (Ravenscroft, N., 2013,) . This is materially higher than the sum of the peak one-day transect count and the highest off-transect count (160 + 51 = 211), and may be optimistic. It caters for the incomplete detectability of butterflies in the heather habitat not visited by the transect route. It is clear from the table that the establishment attempt got off to a very satisfactory start and this was featured in the journal of the Royal Entomological Society “Antenna” (Parker, 2012). The two donor sites have also been monitored, and show no evidence of damage following the donation. The receiving site passed the fragile three to five-year danger zone and the results for 2013 look re-assuring by every measure . However, there is no cause for complacency; regular habitat management remains a key requirement if this colony is to continue to thrive . Fortunately the motivation of everyone involved remains strong. The 2013 season started late and was compressed to 6 transect weeks, with mass emergence pushing peak single day count to 160. Off-transect sightings varied from year to year. In 2013, the 51 counted off transect were present a week before the peak count of 160. See Ravenscroft, N., 2013 for method used for population assessment on14"‘ July 2013. IUCN, 2013, Guidelines for Reintroductions and other Conservation Translocations. Parker, R., 2012 . Monitoring a translocation of Silver-studded Blue in Suffolk . In Antenna 36 (1). Not all of our Silver-studded Blue sites are flourishing, and concerns about dwindling populations and deteriorating habitat at several of the Sandlings Heaths prompted a detailed ecological survey in 2009. 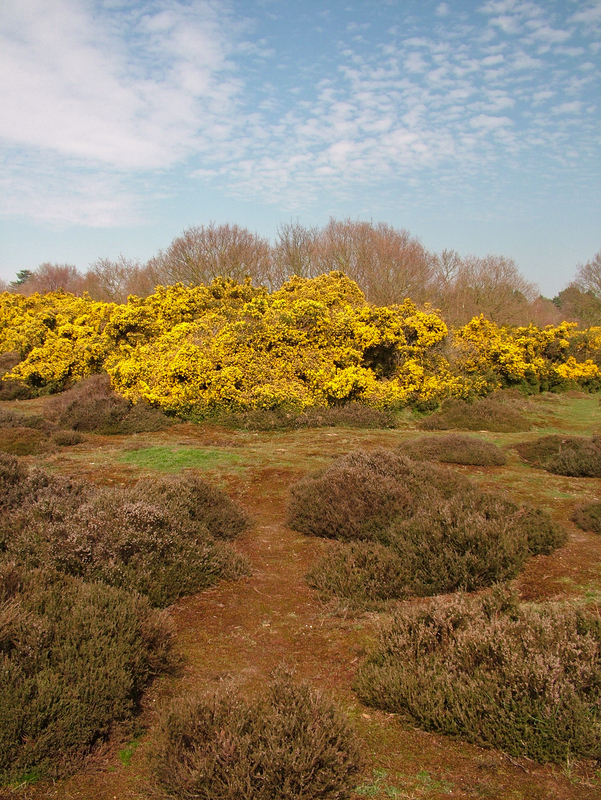 Similar work was done in 1994 & 2003, and an ecological consultant was commissioned to undertake a fresh study embracing four sites considered to be at risk (Purdis Heath, Martlesham Heath, Blackheath and Westleton Common, all of which had different problems). The opportunity to check the health of one of the donor sites for the Blaxhall translocation (Lower Hollesley) was taken, and the suitability of Snape Warren for a future re-establishment was also investigated. The full 34 page report is available in PDF format. There are two versions, one a low-resolution document the other a higher resolution document. You will need an appropriate PDF viewer or plugin to be able to read the documents. In 2009 the Suffolk Branch of Butterfly Conservation commissioned a condition study of several significant county heathlands that held Silver-studded Blue colonies. From that the Branch instigated a series of practical emergency measures to rescue an ailing colony from probable extinction at one of the sites, Purdis Heath, where in less than 20 years the count had dropped from 2,000 to less than 10. The biggest factor contributing to their decline was insufficient management, leading to scrub succession and loss of optimum breeding habitat for the Silver-studded Blue and other heathland species of conservation concern. Volunteers have since stepped in to help manage the site and reverse the decline, undertaking operations such as tree removal, creation of bare ground habitat and heather cutting. This year the count has risen, too early to declare the population as recovering, but an encouraging sign nonetheless. 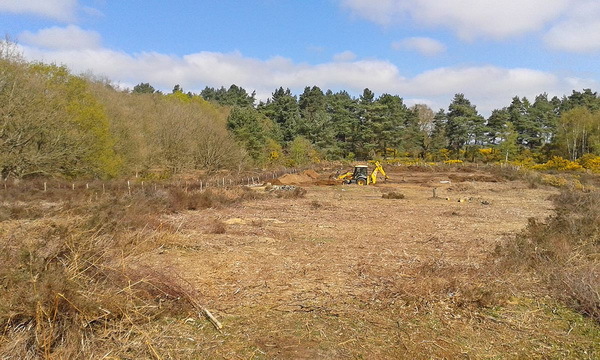 The Ipswich Heaths Project, delivered by Sharon Hearle (Project Officer), will now enable the scale of restoration to be dramatically accelerated, extending the work to include all 14 sites. Funding will also pay for contractors to carry out some of the larger scale works needed. However, community groups and volunteers will continue to be integral in making the project a success, supporting the project officer with practical conservation work and site monitoring. 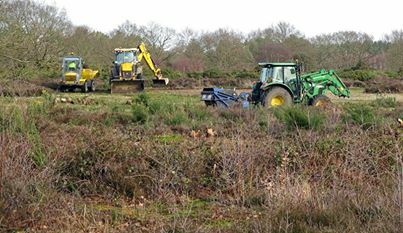 The Ipswich Heaths project, funded by a WREN Landfill Communities Fund grant, is a landscape-scale lowland heath restoration on 11 sites on the eastern fringes of Ipswich. The heathland habitat close to Ipswich is now much reduced and fragmented by new housing, industrial and recreational pressures, combined with a lack of conservation management, this has had a devastating impact on the number of butterflies and moths found. As recently as the 1980s the project’s main site, Purdis Heath, had over 2000 Silver-studded Blue regularly counted, tragically the peak count in 2010 was just four. Since then, Butterfly Conservation and other groups and individuals have stepped up the level of habitat management work, focusing largely on reducing scrub from the heather areas, cutting the heather to promote a diverse age structure and creating bare ground to promote fresh pioneer heather and encourage ants. All these things are needed to improve the site for the Silver- studded Blues chances of survival. In addition to the practical work the site has been well studied, not least by Darren Flint, whose MSc research project involved a study of the population changes of Silver- studded Blue (Plebejus argus) on Suffolk’s lowland heathland in 2013, focusing on Purdis Heath. Darren observed male SSBs actively protecting nectar sources (Bell Heather), a fact he couldn’t find noted in the literature and certainly an interesting behaviour that warrants further exploration. A transect has also been set up and so monitoring the butterflies has become much more organised. In 2013 the peak count of SSBs was 40, a tenfold increase from the precarious situation in 2010. But we are not in a position to sit back and relax yet! This is still a very low number and much more work is needed. However, we can take encouragement that at least things are moving in an upward trend. Other good news, as reported by Darren in his MSc research project, correlating with the increase in butterflies is that the flight area has increased. In 2009 was just 0.1 ha of heathland in the north-west corner, which has now grown to cover 1.03ha spread over three sizeable patches spread across the heath. A 930% increase and not that far off the 1985 peaks of 1.3ha. 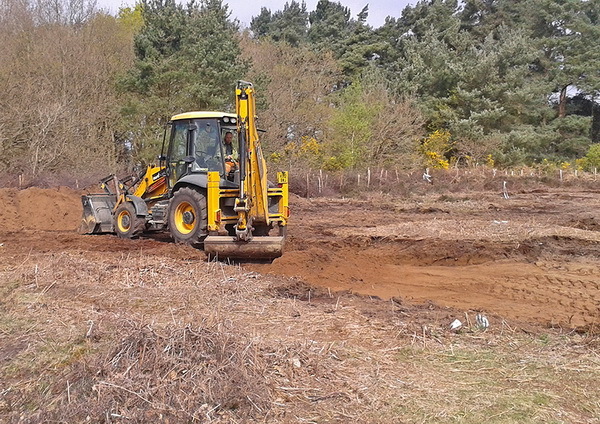 Thanks to the grant from WREN there is scope to do a lot more habitat management at Purdis Heath. Throughout the winter scrub was cut and cleared from more areas of heather, most significantly between the heath and the adjoining golf course. This is to try and create a link between the sites and increase the SSBs availability of habitat to spread in to. The population of SSBs will again be monitored between the flight period of June-July and it is hoped that we will be reporting another increase in the Autumn of 2014. Areas that were previously beneath tree canopy and with ground deep in leaf and gorse litter have been converted to bare ground habitat. In time (with a helping hand of heather cuttings loaded with seed) the area will blossom into pioneer heather heathland again. And hopefully along with the flora will come the fauna we all want - the ants and their grateful friends the Silver-studded Blues! We've finally been getting on with the last stage of this season's work at the heath. This involves mainly scraping with JCB down to the sand /or soil mineral layer and some weed treatment on the original scrape.